The international paper size standard ISO 216 (International Organisation for Standardisation) is the standard that paper sizes are all based on. In other words,1:1.4142 or single aspect ratio of square root of 2. The thickness of paper is known as GSM, or Grams per Square Metre. The most popular thickness of paper used for everyday printing on A4 paper is 80gsm. The thicker the paper, the higher the number GSM it will be, and obviously the thicker the paper, the more it will generally cost. If you are considering having leaflets or flyers printed, then 150-170gsm would be an ideal thickness, as this thickness of the paper is a little more robust and rigid. For front and back covers of brochures, you would normally choose 200-300gsm. For your business cards, 300gsm is usually used. 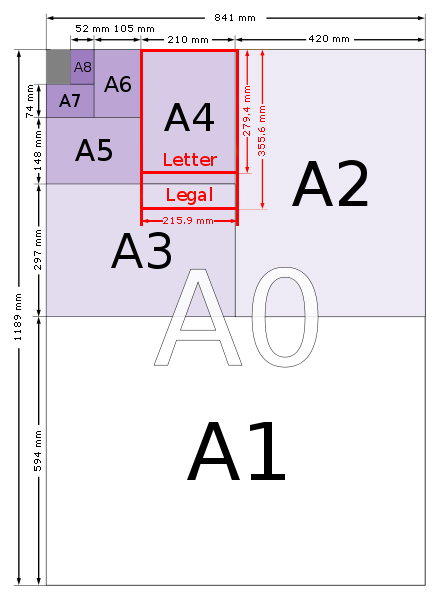 The A Series paper size chart below gives a visual representation of how paper is sized - for example, A5 is half of A4 size paper and A2 is half of A1 size paper. In general, terms, if you take an A4 piece of paper and fold it over once, this will equate to an A5 sized sheet of paper, and if you take an A5 sheet of paper and fold it once, this will equate to an A6 sized sheet of paper, and so on. The paper measurements are determined by halving the measurement of the preceding one. For more information, or to speak to a member of our sales team call us on 01733 511030.